I ran across this exquisite doll depicting a person in a Dzonoqua ceremonial mask and costume. The mask shows the traditional depiction of Dzonoqua, the wild woman of the woods, with her pursed lips as if whistling (as bigfoots are reported to do). Dzonoqua is covered in hair, and is often represented in ceremonies by a person wearing bear fur and a mask as is seen in the doll. In the images above, Dzonoqua’s breasts are depicted indicating she is a female figure, a giantess or ogress, not her mail counterpart known as Bukwas. It is generally thought that she and Bukwas represent sasquatch. For more on the Dzonoqua mythology, click this link. The artist responsible for this piece is the late Shona-Hah, also known as Mary Smith. The work was created sometime around 1980 using red cedar, cedar bark, wood, faux fur, greens and pigment. I think all would agree this is a tremendous representation. Shona-Hah (1912-1997) is the mother of Lelooska, Kwunkwa-dzi, Patty Fawn, and Tsungani. She was born in a black walnut log cabin in Oklahoma’s old Cherokee Nation. There, she was given the name Shona-Hah, “gray dove”. Her Kwakiutl name, Tl’alilhilugwa, bestowed in 1968 by , means “whale rising”. Shona-Hah’s life bespeaks her Indian heritage. In her youth, she both trained horses and rode in races and exhibitions. As a small child, she began participating in the traditional dances and continued throughout her life. Always interested in all facets of Indian art, she exceled at beadwork, skin sewing, carving, painting, and doll making. Her dolls are valued highly by private collectors and museums as illustrations of vanished cultures. They bring alive both ceremonial and every day events in the lives of the people of many different North American tribes. From the Osage of Oklahoma to the Kwakiutls of British Columbia, she draws on first-hand knowledge of the cultures and the memories of the Old Ones for her inspiration. Shona-Hah’s children credit her with their love and respect for Indian art and traditions. She taught them the skills she had acquired and sacrificed to help them become artists in their own right. Passing away in October of 1997, Shona-Hah occupied a place of major importance in the family structure. A cohesive element in the group, she was also an important contributor to the educational programs. She not only participated in them, she also made many of the costumes. If you or someone you know has more information about Shona Ha, her work, or her legacy, I would be very interested to hear more about it. Feel free to contact me by clicking this link and sharing what you know about her. Thank you! ARIEL, Cowlitz County – Shona-Hah prefers old faces. Creased by the years, weary and wrinkled, they have stories to tell. And she helps tell them. She coaxes their stories out of wood, then fills them in with cloth and leather and human hair. When she’s done, the result is a 12-inch doll portraying a Native American; an old Indian,usually. That includes the Clark County dollmaker. Her father performed in Buffalo Bill Cody’s Wild West Show. Born in 1911, Mary Smith is three-quarters Cherokee and one-quarter French. (Shona-Hah is Cherokee for Gray Dove and it is the name she uses professionally.) She says she was born in Oklahoma or Missouri. Their dirt-floor cabin straddled the state line, and “I don’t know which state I was born in,” she said with a smile. She lived on a reservation until the age of 4, then grew up on a Wyoming cattle ranch. At 6, Mary survived being struck by lightning. “Shoshone and Arapaho would come down to touch her,” Don Smith, her son, said. “They thought she was blessed. That’s some heavy-duty blessing. “Don Smith was seated at a nearby table, bent over a block of cedar that will become shore birds nesting on an ocean-side rock. He is better known as noted story-teller and mask-carver Chief Lelooska. “Almost everybody here has more than one name; it’s hard for the post office to sort it out,” said Patty Fawn, Mary Smith’s daughter. Three of Mary Smith’s four children are artists with work on display at the Lelooska Gallery. Mary Smith has been an artist for most of her life, although she might dispute that description. “She doesn’t consider herself an artist,” Fawn said. “But people who collect her dolls fight over them. “One collector calls Mary Smith the modern equivalent of Charlie Russell. “He was the best of the Western artists,” said Ken MacRae of Enumclaw. “She has more skill, she’s better at what she does” than anyone else in her line of work. “I carve to help make a living for my family,” Mary Smith said as her son’s knife released more fragrance of fresh-carved cedar into the room. “It’s a necessity. Isn’t that what drives us all? After the woman bought two huge pieces of velvet for the drapes, “We painted gold dragons on black velvet,” she said. “I carved 100 horses with saddles so we could put a roof on our house here,” she said. Smith has no idea how many Indian dolls she has produced, although she kept a log for several years. “You can see the price go up, too,” Smith said. The early works in the log went for about $250 in the mid 1970’s. One of her latest creations is “The Journey,” showing an old woman and her dog on a trek. It is on display next door at the family gallery with a price tag of $1,250. MacRae said four of Smith’s dolls were selling for $1,800 apiece at a recent Indian art show in California. Each transaction in Smith’s log also described the type of Indian, and what he or she was doing. “I like to have them doing something – making baskets, cutting up a salmon. One played the violin,” Smith said. Her current creation is an Indian woman carrying her grandson in a blanket backpack. Each Indian also represents a particular tribe. “Nobody anywhere is making them as accurately as she is,” MacRae said. I recently ran across this amazing art by an equally amazing artist who goes by the name Viergacht. 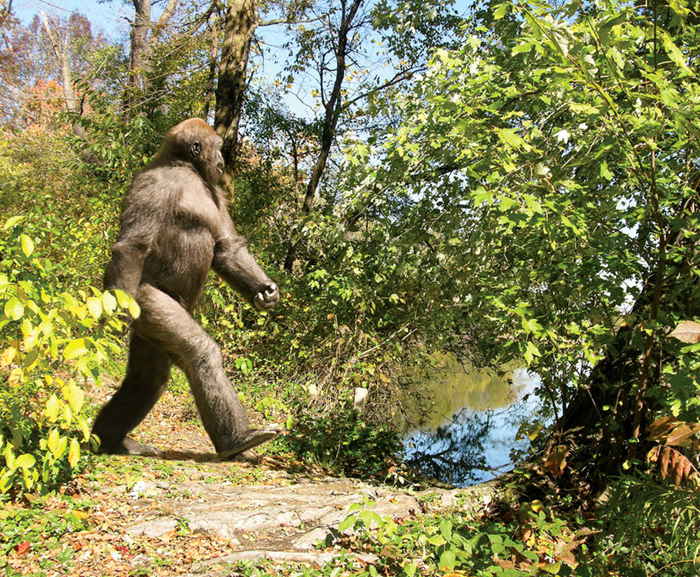 The caption for the photo reads, “A young male North American ape, Anthropoidipes ameriborealis, patrolling his territory. ” Note the nod to Dr. Jeff Meldrum’s 2007 paper, “Ichnotaxonomy of Giant Hominoid Tracks in North America,” which attempted to name the species that left the footprints detailed in the paper. The PDF of that paper is available by clicking this link. I love well-read bigfoot enthusiasts. Viergacht is a fantastically creative and talented artist. He has a presence on the art collective website, Deviant Art, and specializes in realistic animal-esque fantasy stuff, as far as I can put into words. And I love that I have a hard time categorizing this person’s art. 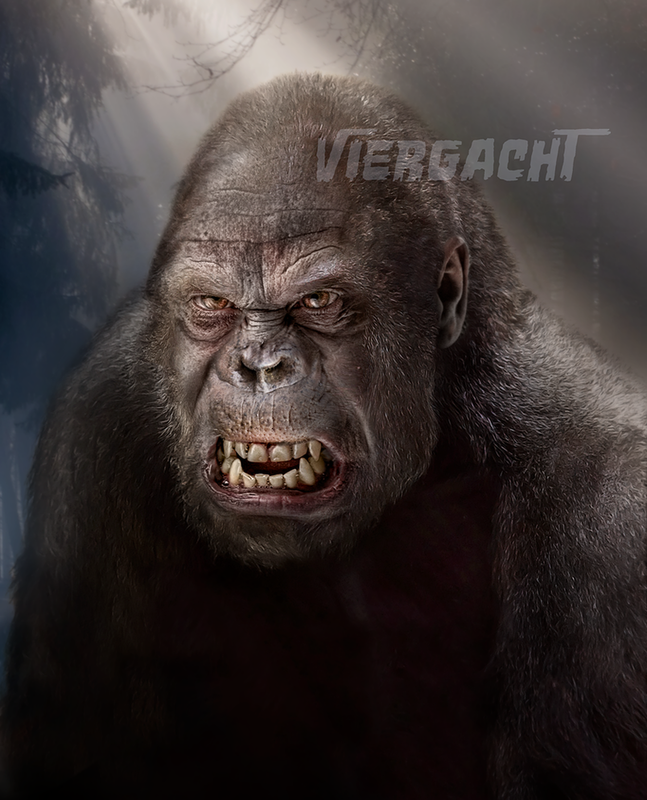 For us bigfooters, it’s important and practical to know about realistic bigfoot art in case they are used in a hoax. This goes for photographs, fur suits, digital art (like the one above), animations, and more. For sheer enjoyment, these art pieces are just fun. Viergacht’s art can be seen by clicking this link. He is available for commissions as well. Start by contacting him at viergacht@gmail.com. Like most people my age, I am a fan of Star Wars, and have been since seeing the original in the theaters back in 1977. At that early age, I even thought that Chewbacca was a sasquatch, which of course makes me smile all these years later due to the whole Matilda fiasco, but I digress. Whenever Star Wars crosses with the bigfoot subject, I am, of course interested, so when I saw the graphic above I wanted to learn more. As it turns out, the story above is true! There is, in fact, a comic book with this story line that was produced by Dark Horse Comics with the above story line. The story, entitled Into the Great Unknown, is contained in Star Wars Tales, Volume 19. The good news is that someone has put the comic book out on Youtube for everyone’s enjoyment. So, below is the Youtube version of that comic book, but be sure to give it a read in case the copyright folks notice that it’s up!